For all the skeptical nuisances reading these lines, let us disappoint you: no, email marketing is not dead. Despite of technology changes and introduction of completely new ways of addressing customers, email marketing is not going to go anywhere unless people stop checking their inboxes. Email marketing is great in achieving various business needs, but there’s a sphere where it’s exceptionally efficient - building long-term seller-buyer relationships. 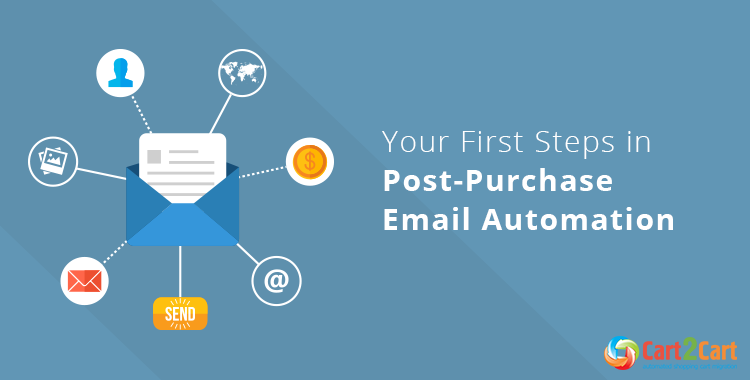 Indeed, post-purchase emails are perfect for turning one-time customers into loyal clientele. But there’s one thing store owners & marketers often unfairly ignore — automation of the process. In the business where time equals money, knocking your customers’ inboxes on a perpetual schedule manually is no less than foolish. So, logically, it’s smart to look into automation, which allows you to write, schedule, and automatically send relevant messages to your customers timely. Relevant and timed — that’s the definition of a strong letter. When using automation tools, these two characteristics can be achieved with the help of triggers that differ email content depending on customers’ activity. And once you set your email marketing machine going, it’ll work for you forever. The only occasion completely not suitable for writing this follow-up email is promoting more products — a first-time customer is unlikely to buy again so fast and might consider such aggressive marketing as unrespectful. At best, dispatch from a real email account that accepts replies. Otherwise, it will ruin the personal character of the letter, making it pretty meaningless. There’s nothing worse than trying to sound “personal” and including that ugly “THIS LETTER WAS SENT AUTOMATICALLY PLEASE DO NOT RESPOND TO THIS LETTER” sentence at the bottom. The best practice here is to think carefully what are your new customers’ specific needs are and build the emails around it. Don’t forget about segmenting your emails (the same email can’t be relevant to everybody, right?) and don’t overdo — too many letters looks spammy. So, let’s suggest that some of your subscribers got inactive for a while. What to do? Setup a trigger in your marketing automation tool to send out emails with, perhaps, a discount code or special offer to encourage people to make another purchase. On the other hand, you could set it to stop messaging them for a while, and reward most active users instead. Both strategies make sense, and it’s important to find that happy medium between being intrusive and careless. Hopefully, you already have a few ideas of how can you address customers via email. Now, you need to pick an appropriate tool for that. There is a number of such: ActiveCampaign, GetResponse, MailChimp, etc. We personally (no promotion!) prefer and actually use MailChimp, since it’s very comprehensible, functional and has a lot of useful documentation. Moreover, nearly every popular shopping cart has an official or custom MailChimp integration, which gives you an opportunity to sync your store’s customer and order data with your MailChimp account. As easy as that, you can create an Automation Workflow — a string of automated emails that are triggered by an event of your choice. You can also create segments within Workflow, so that only specific customers receive specific emails. These could be, for example, inactive users for a month, users located in Canada, users who bought jeans, etc. You can read about it more in MailChimp’s official documentation. Please note, however, that Automation Workflow feature is paid. Yes, it might be tough: just like social interaction in real life, successful communication with your customers via email requires skills and knowledge. And yet, email marketing has one of the highest ROI rates among other marketing channels and, probably, is the best way to build long-term seller-buyer relationships. But you know what’s easy? Migrating your store to one of 70 shopping carts supported by Cart2Cart. No, really: it’s so easy you can do it with your eyes shut… though we recommend to keep them open and enjoy Cart2Cart’s brand new design 🙂 Start FREE Demo migration now!